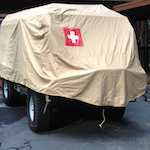 72 Pinzgauer 710M for Sale - THE PORTAL HUB - Pinzgauers, Haflingers, Volvo 303s and more! I've got a list of upgrades somewhere but of most of my pinz stuff is in storage with the vehicle. Owned since about 2008 and has been good times since. Don't really want to sell but I relocated to Southern Oregon and don't have the room for her anymore. The pinz is currently in garage storage in Auburn, CA; she hasn't been fired up in a year but ran well when I parked her. If interested, please let me know if you have any direct questions and I will try and answer them. Will try and update with vehicle details but its a basic 710m with a custom bummer/winch and the winter soft top, not too much more to say. Current CA no-op register and have title. "exoskeleton" part of the tubing ties into the truck overall. I'd be interested in more pics as well. Same. Is there a cage on it? This guy hasn't signed in since June.